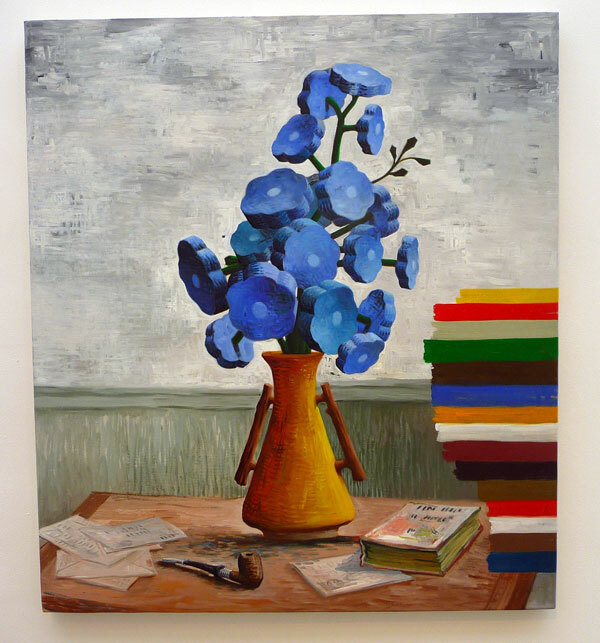 Above is a painting by Sally Ross, who shows in New York City, as recently as a 2010 Gallery Lelong group show, which featured the top image (found on a blog via Google images). I met the artist briefly in the 1990s and have seen and admired her work here in the NY metro area. 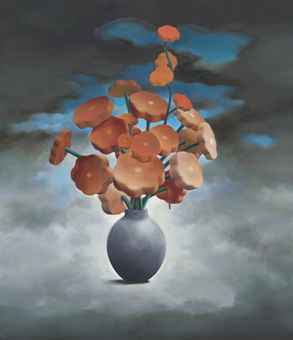 She specializes in carefully-painted surrealistic still lifes, often where the subject is cartoonishly thickened, such as the above flowers. Her stroke and sensibility is similar to that of her brother in real life, Alexander Ross, painter of intricate green biomorphic blobscapes. Christie's sold the smaller image above and apparently misidentifies New York's Sally Ross as a different Sally Ross, from Melbourne, Australia, who has won the Google Images battle decisively. It wouldn't be an understatement to say that the Melbourne Ross annihilates the New York Ross on Google, to such a degree that Christie's uses the tag "Australia" to identify the New York Sally Ross's painting. Yet the provenance for the Christie's image was Feature Gallery, NYC, and there are no New York shows on the Melbourne Sally Ross's resume. Also, 1969, the birthdate Christie's gives the New York Ross, is on the Melbourne Ross's resume. 'twould be an amazing coincidence if both artists had the same birth year. Apropos of this post on recommendation engine-uity, it's what happens when you let Silicon Valley's bots make cultural determinations -- the better artist can be eclipsed even in the tastemakers' auction spaces.